Posted on June 26, 2015 by Karatzas Marine Advisors & Co. IDENTIFICATION: Launch Name was Zim Chicago. 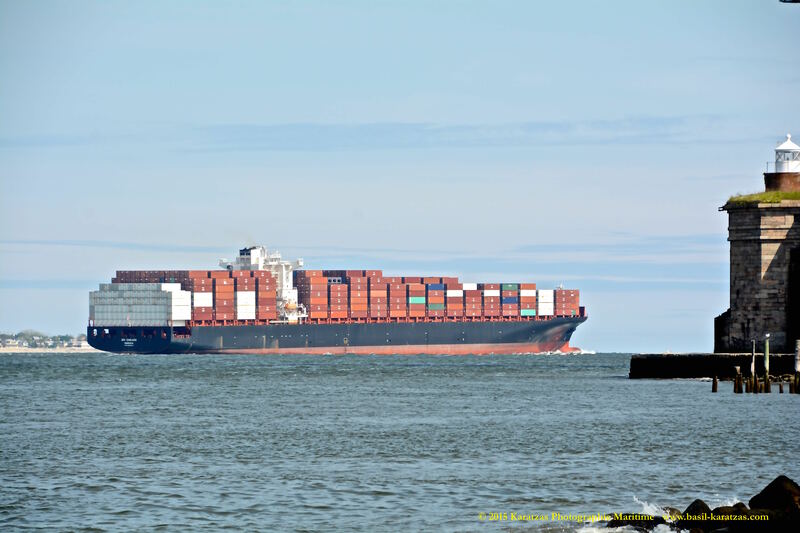 Post-Panamax Containership, Call Sign A8SI9, IMO Number 9398424. Built at Hyundai Samho HI, Liberia Flagged, LR Classed. DIMENSIONS/TONNAGES: Moulded Depth of 20.14 m., Tonnage of 60,300 International Net and 106,859 Dwt (long). Length Overall of 334.00 m., Length Between Perpendiculars of 319.00 m., Draught of 15.00 m., Beam of 42.80 m., Gross Tonnage of 91,158. ENGINE DETAILS: Engine Description 2 S.A. 12-cyl., Engine Model 12K98MC-C6.2, MAN B. & W. Engine, Speed of 24.50 kts at 250.00 tonnes per day, Heavy Fuel Oil, Horsepower of 93160. 1 Bow Thruster(s). OWNER / MANAGER DETAILS: Zim Integrated Shipping Services Ltd., company website: http://www.zim.co.il. Operators are Zim Integrated Shpg. SPECIALIZED DETAILS: Teu Capacities of 8,440 Total, 6,340 Homogeneous and 1,400 Reefer, 9 Holds, Ship is too large to transit the Panama Canal, Dwt to Teu ratio of 12.86. Total Teu Capacity of 8,440, 9 Holds. Crew complement of 20 people, CARGO HANDLING: 700 Reefer Plugs. MAIN ENGINE: 1 x Diesel – MAN B. & W. 12K98MC-C6.2 2-stroke 12-cyl. 980mm x 2400mm bore/stroke – 68,520mkW total at 104rpm. AUXILIARY: 4 x Aux. Diesel Gen – 4-stroke driving 4 x AC generator(s) at 11,200ekW total, (14,000kVA total) 6600V at 60Hz. 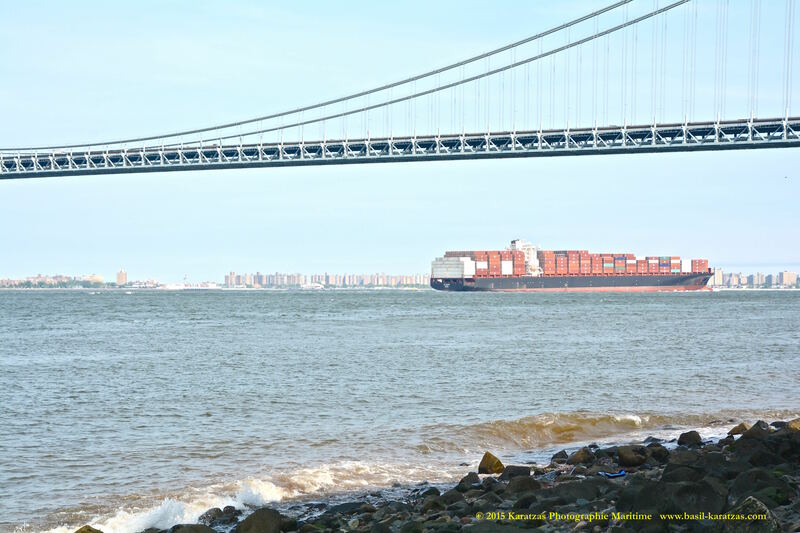 Post-panamax containership MV ‘Zim Chicago’ (8,500 TEU, built at Hyundai Samho in 2010) departing New York Harbor. Karatzas Photographie Maritime. 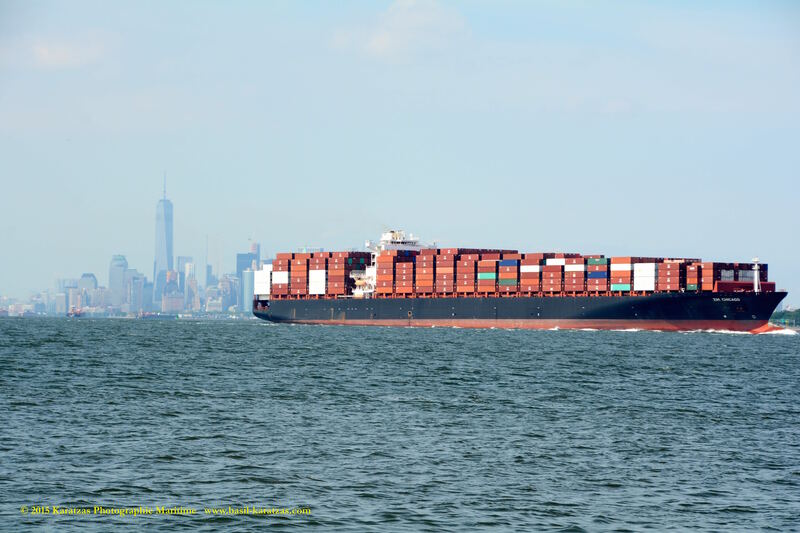 Post-panamax containership MV ‘Zim Chicago’ (8,500 TEU, built at Hyundai Samho in 2010) departing New York Harbor. Statue of Liberty visible at the right corner of the image. Karatzas Photographie Maritime. 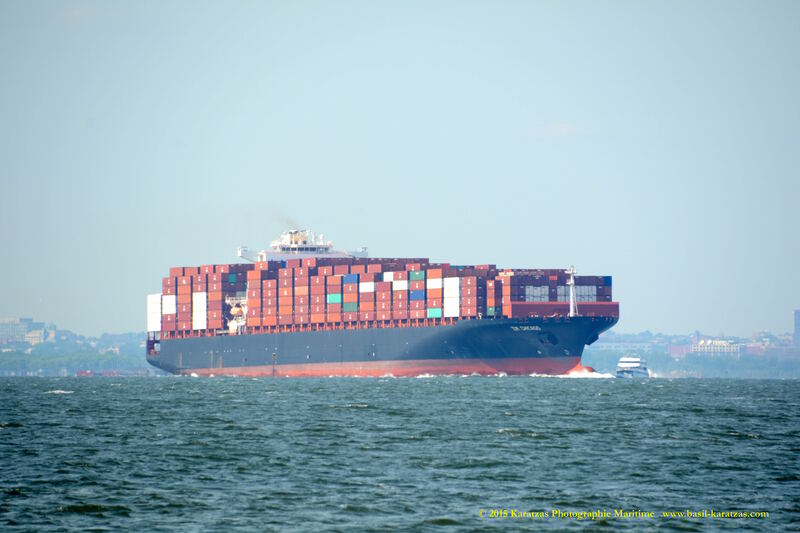 Post-panamax containership MV ‘Zim Chicago’ (8,500 TEU, built at Hyundai Samho in 2010) departing New York Harbor. Statue of Liberty visible at the right of the image. Karatzas Photographie Maritime. 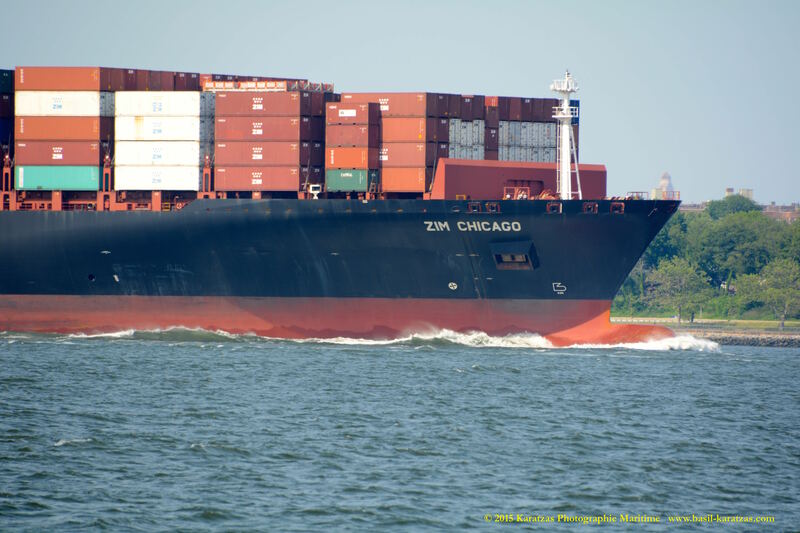 Post-panamax containership MV ‘Zim Chicago’ (8,500 TEU, built at Hyundai Samho in 2010) departing New York Harbor. Downtown Manhattan skyline and World Trade Center in the background. Karatzas Photographie Maritime. 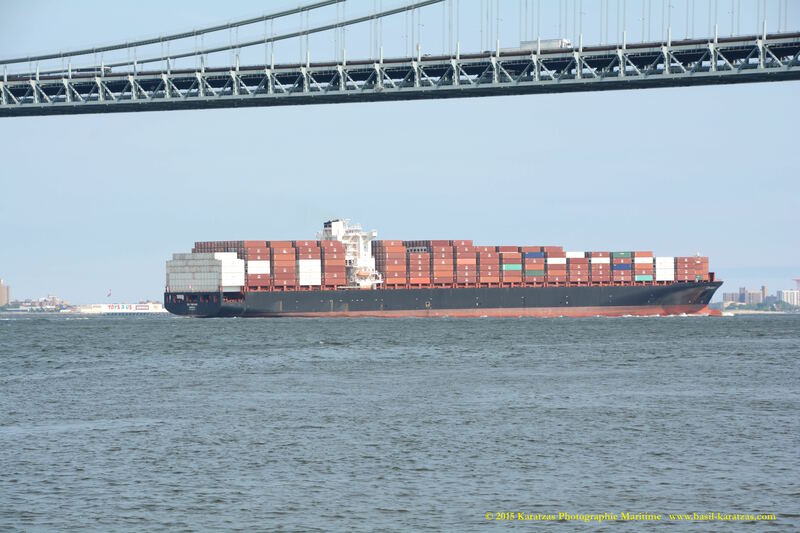 Post-panamax containership MV ‘Zim Chicago’ (8,500 TEU, built at Hyundai Samho in 2010) departing New York Harbor. Detail of the starboard bow. Karatzas Photographie Maritime. 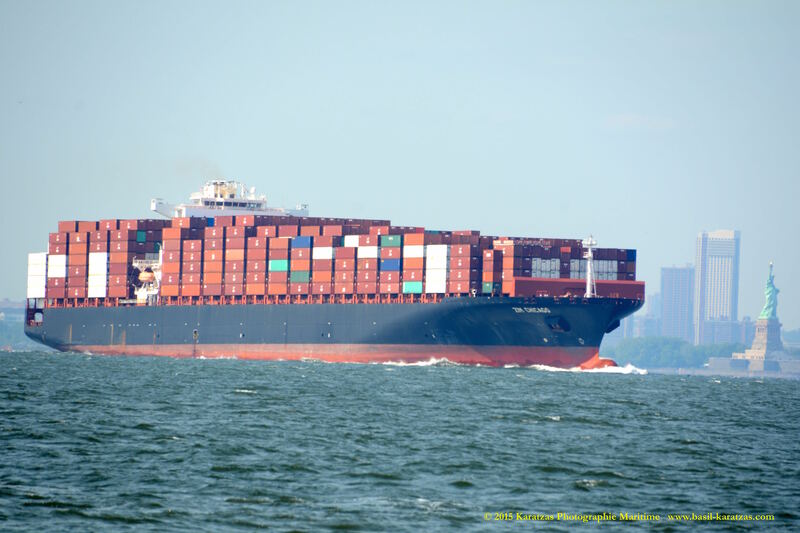 Post-panamax containership MV ‘Zim Chicago’ (8,500 TEU, built at Hyundai Samho in 2010) departing New York Harbor. It would appear that the World Trade Center just got shorter… Karatzas Photographie Maritime. 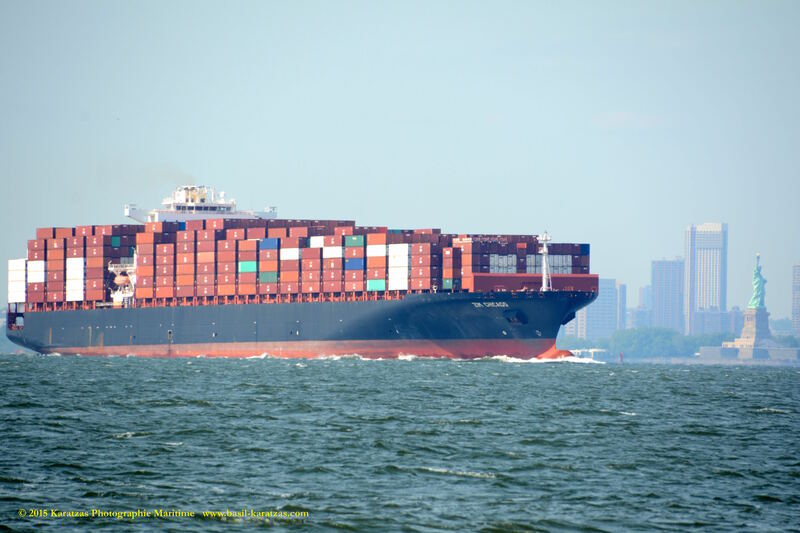 Post-panamax containership MV ‘Zim Chicago’ (8,500 TEU, built at Hyundai Samho in 2010) departing New York Harbor. 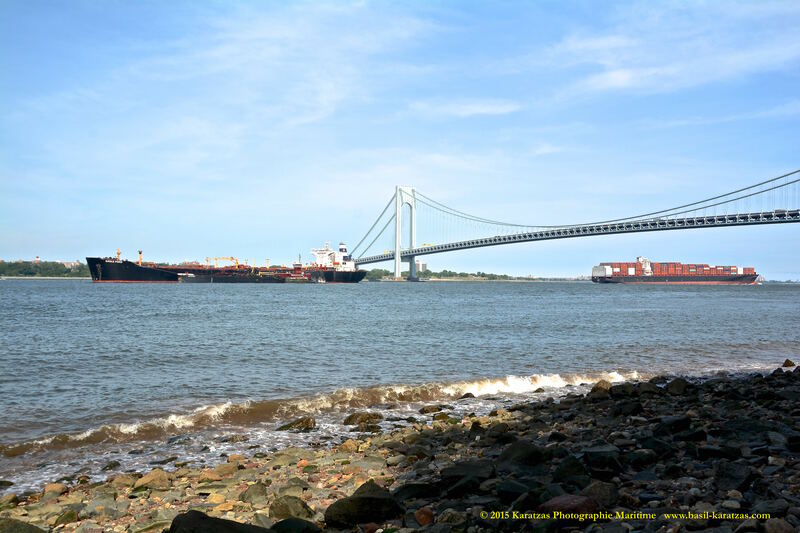 Passing under the Verrazano-Narrows Bridge; Jones Act suezmax tanker MT ‘Eagle Ford” at anchor. Karatzas Photographie Maritime. 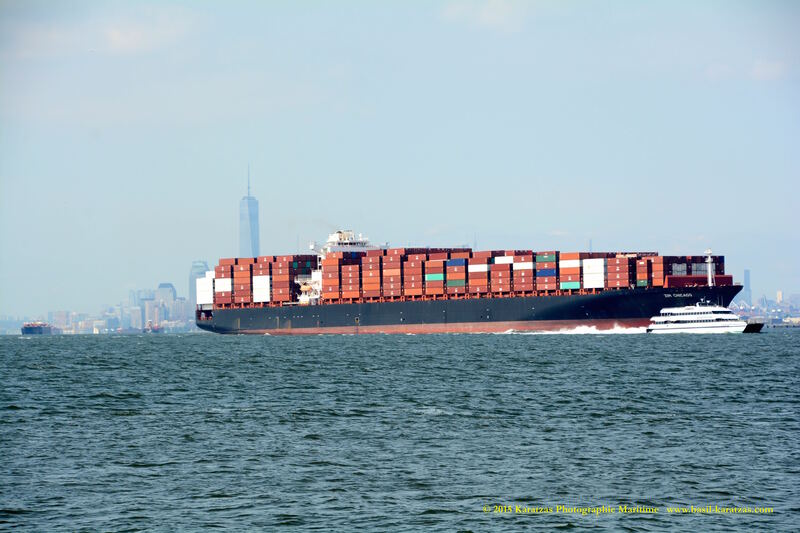 Post-panamax containership MV ‘Zim Chicago’ (8,500 TEU, built at Hyundai Samho in 2010) departing New York Harbor. 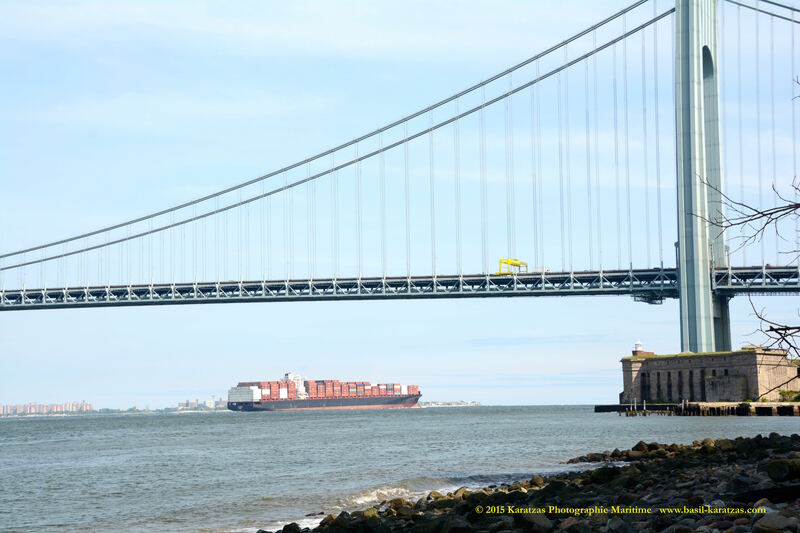 Passing under the Verrazano-Narrows Bridge. Karatzas Photographie Maritime. 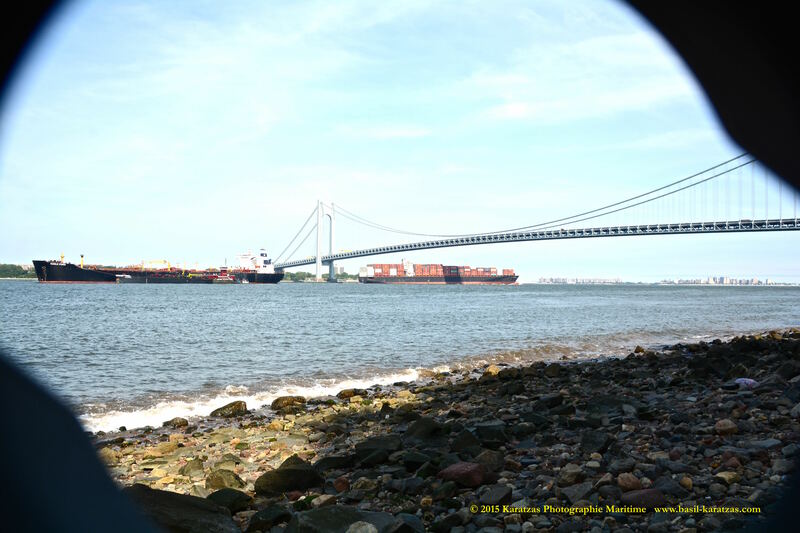 This entry was posted in Containership, Port of New York and tagged Karatzas Photographie Maritime, Manhattan skyline, post-panamax, Statue of Liberty, Verrazano-Narrows Bridge, Zim Integrated Shipping Services Ltd. by Karatzas Marine Advisors & Co.. Bookmark the permalink.